Recipe | Eat It, St. Louis! Would They Love Me Anyway? I’m almost 98%* certain the answer is, “Yes, my friends would love me if I didn’t make the Artichoke Chicken Salad.” I’m just as certain, however, that being the purveyor of this side dish didn’t hurt when guest lists were being developed in the early days of my St. Louis social life. Looking back, I’m glad I didn’t have to rely wholly on my classic good looks and sparkling personality to get me through the door. Now, 12 years later, I’m fully ensconced in a wonderful group of true friends. Together we’ve celebrated life’s greatest joys and weathered its cruelest blows. We’ve planned and plotted; laughed and cried; risen and fallen; we’ve recovered and thrived. Rarely have I walked through any door without my ticket, and it never fails to deliver yummy satisfaction regardless of the occasion. I’m thrilled to share this often-requested recipe with you. Step one: Cook the long grain and wild rice per the package and set aside to cool. Step two: Take the skin off of the chicken and the meat off the bones. (Use is all!) By hand, shred the meat. 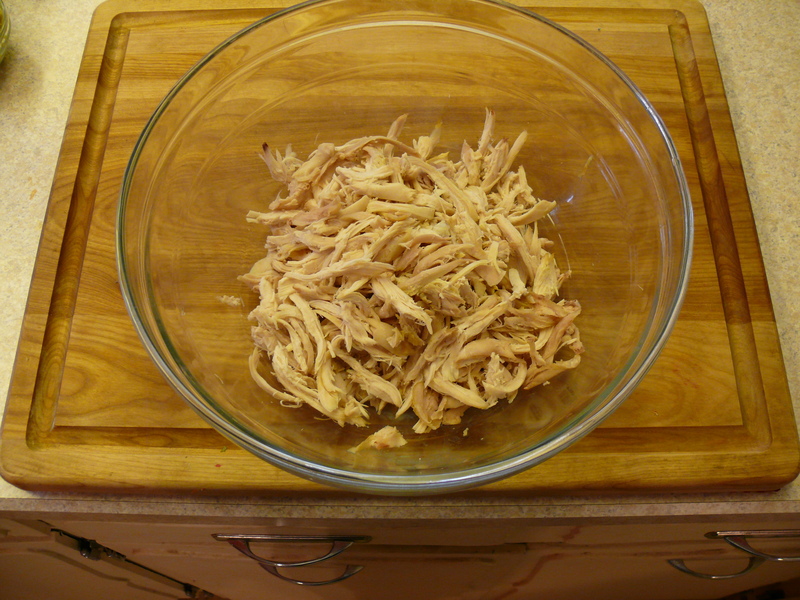 Shredded chicken. Not much to look at, but yummy. 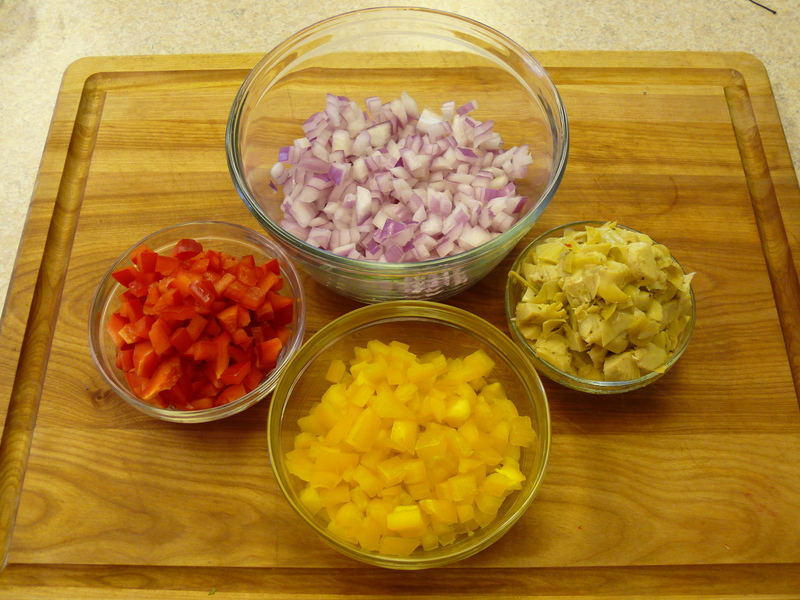 Step three: In a large bowl, combine the chicken with the red pepper, yellow pepper, red onion, and chopped artichoke hearts. All the chopped veg. Pretty! Step four: In a medium bowl, whisk the reserved artichoke marinade with the mayonnaise until it becomes a smooth dressing. Set aside for a moment. 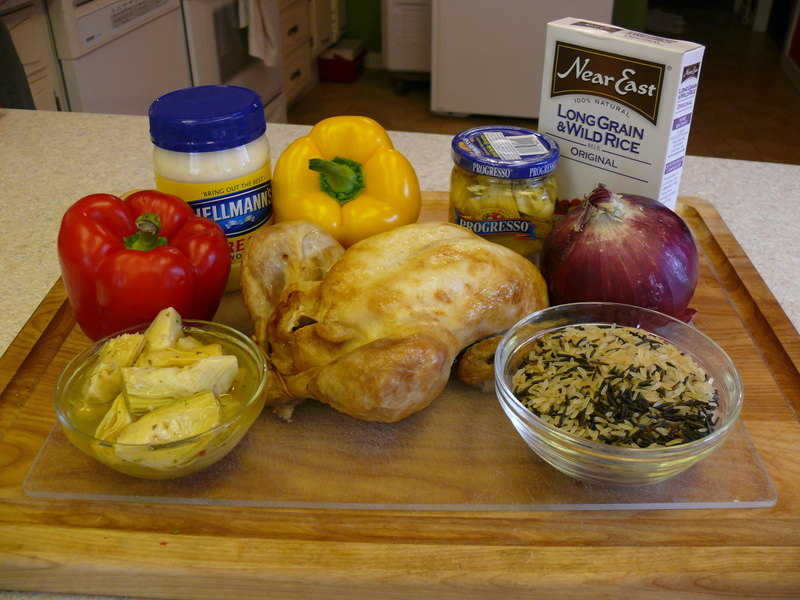 Step five: Add the cooled rice to the chicken and vegetables, and mix well. Step six: Pour all of the dressing over the top, mix well, and refrigerate. I hope this recipe works magic for you like it has for me. If this this kind of dish isn’t your cup of tea, take some time to develop your own signature offering for pot-luck parties. Between football season and holiday events, the invitations will begin arriving soon. Whether it’s a dip, dessert, side, or a cocktail, please know that I plan to Eat It, St. Louis! * Why not 100%? Well, that would be a blatant act of hubris that would call for a God smack. A little humility never hurt anyone. ** Notes: This is a recipe for which the brand of ingredients makes a difference (in my opinion). The Near East doesn’t taste as salty as others; the Progresso oil-based marinade has perfect balance. Don’t panic if you can’t find the exact brands, however. This salad is delicious no matter what. It’s fool proof. Unless you get water-packed artichokes … then salad has no flavor and the dressing falls apart. Also, in the original version, which my mom makes, the salad calls for a can of sliced black olives. I don’t like olives, so I leave them out. But in all fairness, I thought you should know. 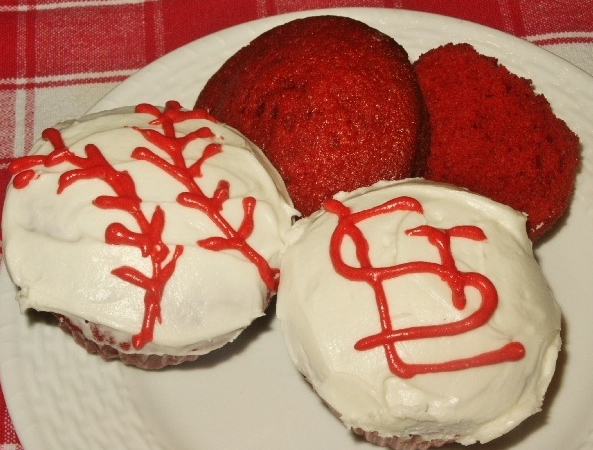 Red Velvet Baseballs … YUM! Opening day is coming up quickly! On Thursday, March 31, thousands will flock to Kiener Plaza in downtown St. Louis to cheer in a new baseball season, to cheer on the St. Louis Cardinals, and to cheer about being part of Cardinal Nation. The party will continue at Busch Stadium when the first pitch is fired across the plate at 3:15. Many of us, however, won’t be able to break away from our usual routines. Kids have school; adults have work. We all have things to accomplish and “middaycations”* can be tough to justify. That’s why I’m delighted to share with you my recipe for Red Velvet Cake, which when made into cupcakes can add a dash of Cardinal spirit to any lunch box or office break room. The bright red cake and rich cream cheese icing – red and white to show Cardinal spirit – will be a home run with your kids and colleagues alike. The cake really is a vibrant red! The Red Velvet Cake & Icing recipe that follows was one that a neighbor shared with my mom, Gwen, when we lived in Cheyenne, Wyoming, circa 1975. It’s been my favorite since I was little, and I was always impressed that my mom made the whole thing from scratch. This is the first cake – actually, it was the first anything – I ever made from scratch. And I messed it up. After three frustrating hours and loads of huffing and puffing, I couldn’t understand why the cake wouldn’t bake. I showed my step-mom, Kathy, the instructions. She patiently read over the recipe and gingerly suggested that I’d baked the frosting in the cake. 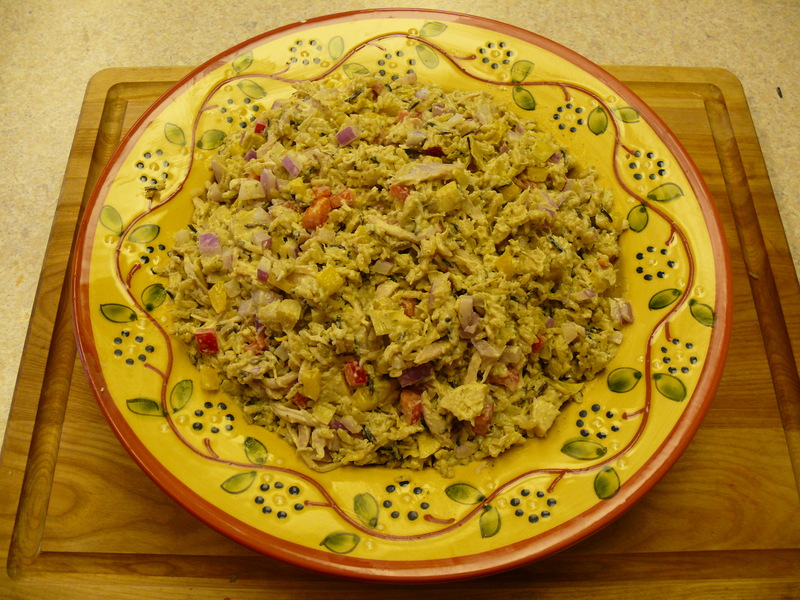 Regardless of how I flubbed my first attempt at this recipe**, it is an easy one. I’ve restructured it a bit and added in some helpful hints I’ve picked up along the way. • Pre-heat the oven to 350 degrees. • In a large bowl, combine sugar, oil, eggs, and vanilla. Mix well. • In a small bowl, stir (carefully) the red food coloring and vinegar together. Add this to the sugar-oil mixture and mix well. The color is gorgeous! • Add the dry ingredients and the buttermilk – alternately – to the sugar-oil mix. Always begin and end with the dry ingredients. • Fill with a ¼-cup of batter. • You will get approximately 2 dozen cupcakes. • Grease and flour (even non-stick) three 9-inch cake pans. • Divide batter evenly among the pans. • Bake for between 20 – 30 minutes. • Cool pans on wire racks for 10 minutes. Turn cakes out onto wire racks and continue to cool. • When completely cool, peel back the parchment paper. Red Velvet has always been a crowd pleaser, and I’m happy to share the love. 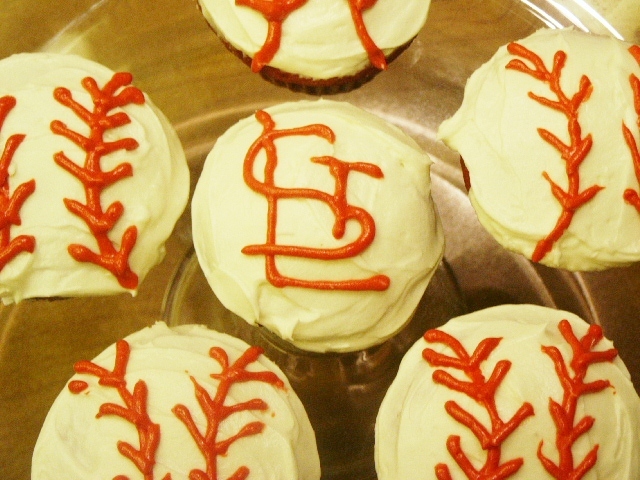 Enjoy the recipe, bake for your team, and Eat It, St. Louis! Big thanks – and mad props – go out to Jennifer Buckman, the wife of a high-school friend. When she heard, via Facebook, that I was intimidated to pipe frosting for the first time, she generously offered to talk me through it over the phone. Her tips – apply even, steady pressure; use room-temp frosting; and keep on trying – were exactly the encouraging words I needed. I should also mention that Jennifer and I have never met face-to-face. As a matter of fact, I don’t think I’ve run into her husband, Jon, since we graduated from high school. But through our shared love of baking, we have connected. Food brings friends – old and new – together. *Middaycations = vacations in the middle of the day. Yeah, I made up a word. Should I call the OED? ** I still use the recipe that Mom typed out and sent me so many years ago. There is something very special about the legacy of the slips of paper that fill my recipe box. I’ve been collecting personal recipes from my family and friends for years. No matter what, they are always with me when I’m in the kitchen.